The 24.43 metre motor yacht Abby Grace, listed for sale by Debbie Beere at Dbeere Yachts, has been sold with Foulques de Raigniac at Camper & Nicholsons introducing the buyer. 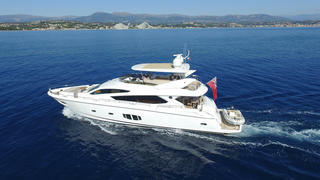 Built in GRP by British yard Sunseeker International, Abby Grace was delivered in 2011 as a Sunseeker 80 model. Accommodation is for eight guests in a master suite, VIP stateroom and two twin cabins — all with en-suite facilities. In addition, there are quarters for three crew. Her high specification includes zero speed Trac digital fin stabilisers, upgraded generators, upgraded air handlers, a GRP hard top with an opening canopy on the flybridge and upgraded tropical air conditioning. She also comes with the optional central staircase solution giving the accommodation area a balanced feel with all cabins benefitting from generous space. Her gleaming white hull is complemented by a light and elegant interior, finished with cream soft furnishings, carpet and panelling and with satin black walnut woodwork. The stylish large windows in the saloon area ensure the optimum amount of light filters through. The extensive exterior space provided by the flybridge, foredeck and aft deck provide an excellent selection of areas for entertaining and relaxing al fresco. Twin 1,550hp MAN engines give her a cruising speed of 24 knots and from delivery she has been meticulously maintained by a fastidious owner supported by a full time crew of three. Lying in the South of France, Abby Grace was asking £1,695,000.